Greater London Authority mugs Hackney. Dalston blighted. 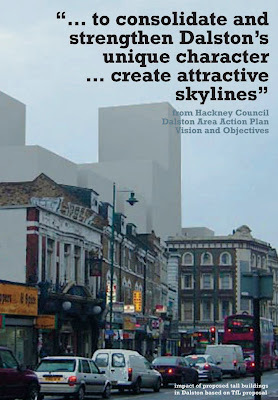 The demolition and redevelopment deal for New Dalston, brokered between Hackney Council and Ken Livingstone's agencies in May 2005, is shortly to be sealed. 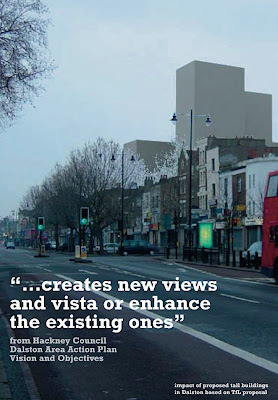 All the money from selling the Council's site will be taken by the London Development Agency and dense and poorly designed towerblocks will be built which will dominate the low-rise Victorian streetscape and will blight Dalston's environment. 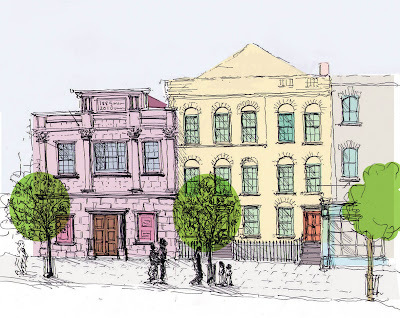 On 23rd April Hackney Mayor's Cabinet authorised its officers to grant a 125 year lease of the Dalston Lane (South) site and 1-3 Roseberry Place (Boss Shoes factory) to the developer, Barratts, for a peppercorn. In return Hackney will get a shell of 4 floors, for a new library and archive resource, in one of the new tower blocks that will front Dalston Lane. Barratts will contribute £1.2 million "planning gain" money to the fitting out costs which are expected to exceed £2 million. All the money which Barratts would otherwise pay the Council for it's land will be paid to the GLA's London Development Agency towards the cost of constructing a £39 million concrete slab and bus station over TfL's neighbouring Dalston Junction railway station. Barratts will then have the right to build more tower blocks on the slab. The Council will only start to recover its £2 million "set up" costs for the development, which include the demolition costs of Dalston's historic buildings which were on the site, if the receipts from the sale of Barratts 525 towerblock flats exceed £154 million. Although in November 2005 the Council's Property Services officers told OPEN they valued the Council's site at about £15 million the value has recently been agreed "in principle" to be £7 million. The Council has now been advised by independent solicitors, DLA Piper, that the disposal of its site - for a peppercorn to Barratts - is "for less than the best consideration that can reasonable be obtained" and the Council must therefore obtain government approval for the deal. The Council will seek to persuade the Secretary of State that the replacement of Dalston's historic buildings by a library shell and the new tower blocks on its site, with children living in buy-to-let flats up to the 20th floor and only 28 flats for social renting, will improve "social well being". It will argue that new towerblocks dominating the area and the new open space, none of which will have any direct sunshine for on average 22 hours a day, will improve the "local environment". It will argue that letting the LDA have all the money towards the cost of the slab will enable a bus station and a high-rise residential and retail development to be built and that this will attract national brand clothes shops to the site (with new jobs for shop workers - on minimum wages). This, the Council will say, will "achieve the objectives of the Council's community strategy and benefit the area and its residents". 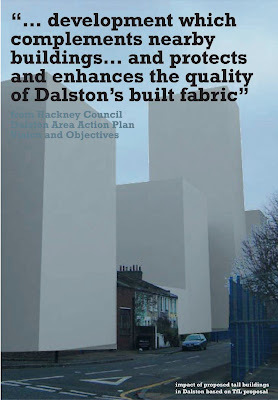 OPEN has previously made representations to the Secretary of State that the proposed development, involving the £39 million concrete slab, was a profligate use of financial and natural resources and would destroy Dalston's heritage buildings and character and blight the area. However the Secretary of State refused to intervene because, it was said, the re-development was essential to the Olympic infrastructure for 2012. How it could have been - restored as part of a new housing and railway station development. 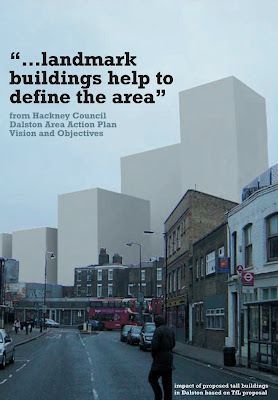 "These buildings represented the heart and soul of Dalston. 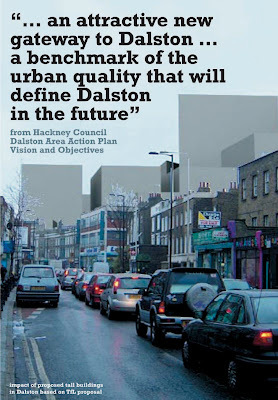 We believe they represented both the past and the future of Dalston’s prosperity. We wanted to see them restored so that we could show our grandchildren how Dalston used to be and so they could share our pride in our heritage and identity." How it is today - destroyed by Hackney Council with the approval and agreement of Transport for London, the Greater London Authority and the Secretary of State.